When we read text alone, we are likely to remember only 10 percent of the information 3 days later. If that information is presented to us as text combined with a relevant image, we are likely to remember 65 percent of the information 3 days later. Known as the picture superiority effect, the phenomenon applies to any visual display, not just images. 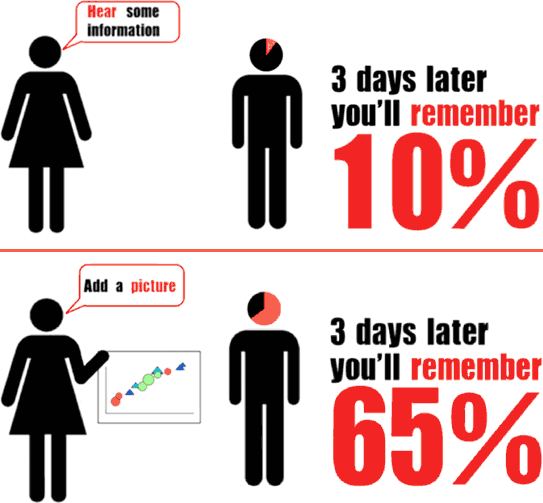 Therefore, people are also more likely to remember concepts when they are presented to them as charts and graphs rather than as words. Source: Brian Rules, John Medina.